Since the dawn of humanity, textiles have been a sought after art form, with coloring, weaving, and dyeing used to signify social standing, interests, and power. As fascinating as the woven art is itself, the process is arguably more so, with each artist’s process giving you insight into their work and their self. 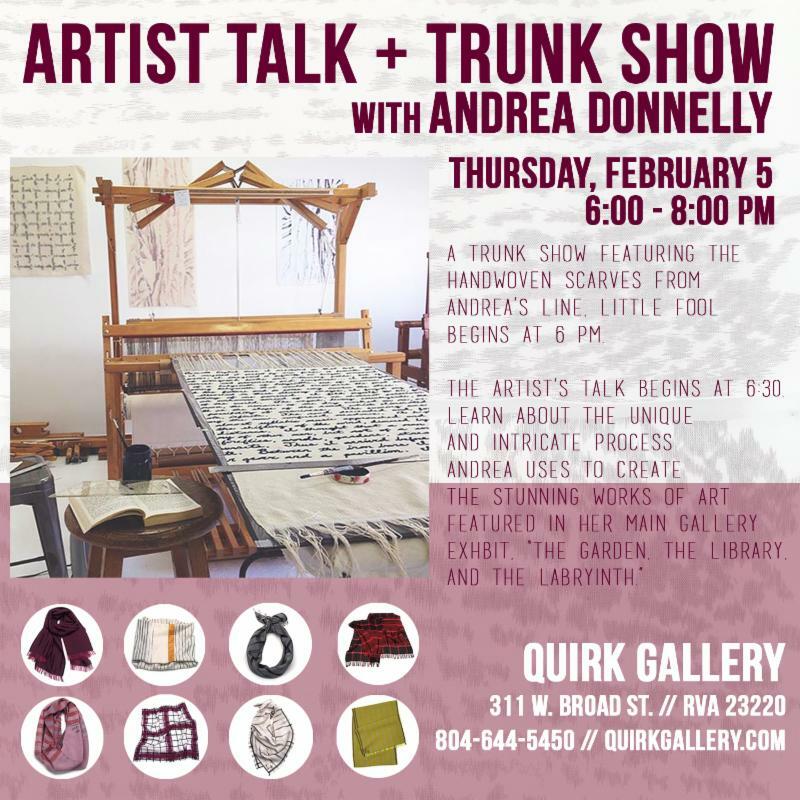 Tomorrow at Quirk Gallery, artist Andrea Donnelly will give an artist’s talk and trunk show about the steps she uses to craft her fine textile works. Donnelly is an artist well known for her woven pieces, particularly her Little Fool line of scarves. No stranger to artist’s talks, Donnelly has done several over the course of her career. Exhibiting her work throughout the country, she typically finds time to accompany her work with insights into her process. Donnelly loves the spaces not only because it allows her to be near her work, but it also allows for patrons to interact and ask questions. Donnelly’s specialty is textiles, and she has been weaving since 2003. With a bachelor’s degree in Artistic Design and a Master’s in textiles, she is more than experienced in her field of choice. Touring throughout the country, Donnelly’s art is not only featured domestically but internationally. This year her work will be featured in at least four major museums throughout the nation, which Donnelly says is a very rewarding experience for her as an artist. Not just a gallery artist, Donnelly also runs her own clothing line named Little Fool. 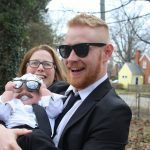 The name for her business came to her one night post-grad school and is a reference to a cherished childhood memory of her father. Donnelly’s trunk show opens tomorrow at Quirk and runs through February 28th. It will feature a collection of her scarves and pieces from her “The Garden. The Library. And the Labyrinth” exhibit, and runs from 6:00pm to 8:00pm, with Donnelly giving her talk at 6:30. Come down to learn more her unique process and gain greater insight into intricacy of her work.